In this article, you will find 3 different creative ideas for strategy diagrams designed in PowerPoint. 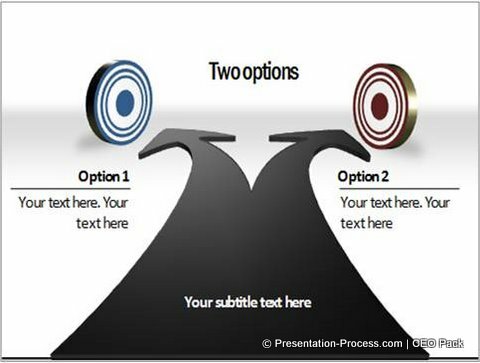 Get inspired to create your own set of templates for key business presentations. As a business presenter, you would’ve realized that making a strategy presentation is quite different from making any other presentation. Your content is mostly conceptual. Your ideas originate from your big picture thinking. You can’t capture the depth of your thoughts using the usual ‘boxes and arrows’ type of diagrams. You can’t use pictures that hijack your audience attention either. You need a wide variety of well thought-out diagrams that can capture your ideas far better than what text based slides can do. But unfortunately, it is not easy to find good strategy diagrams that communicate your ideas in an insightful manner. In this article, we’ve tried to show you some interesting and creative diagram options based on our experience in management and training roles. We hope to inspire you to create your own set of diagram templates based on the options we present to you. When you want to convey a concept to your audience, sometimes you may need to go beyond just abstract representation. That is when simple insightful visuals come in handy. Sales Strategy Presentation Example:One of our clients in financial sector wanted to talk about how multiple senior managers set different targets to the same group of sales people. 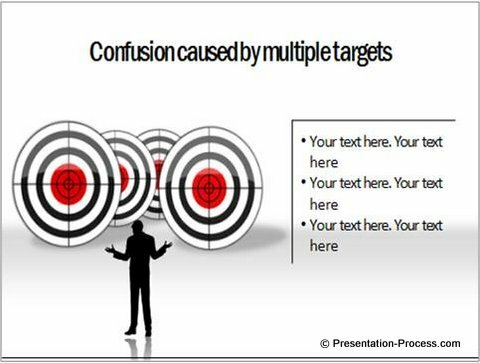 In the end, the sales people end up confused, trying to chase these multiple targets simultaneously. We represented this by making multiple copies of a target board and captured the ‘confused state’ using a silhouette. This simple representation quickly set the context for the presentation. We haven’t shown the actual content here since all client presentations are confidential. If you want to represent two targets as two options available, you may use the visual of a diverging road leading to two different targets (represented by different colors). By using an appropriate visual you help your audience get your context quickly. Don’t be afraid to combine visuals with diagrammatic representations. Another way to convey your strategic concepts is to use easily understood metaphors. Competition Strategy Example:For example, one of our clients wanted to provide a top level view of what was going on between them and the competition. We used a chess board to represent the idea of ‘Us versus Competition’. We used a raised platform to represent the ‘top level view’ of the situation. The rungs represent organization levels. Actual content not shown here as client presentations are confidential. When you use metaphors, your message reaches your audience in a memorable way. Interestingly, this diagram is now available as part of the CEO Pack. The pack has tons of useful and simple metaphors designed as editable diagram templates. The individual parts of the slide can be copied and used in other slides to establish continuity. That makes these ‘concept based strategy diagrams’ versatile and useful for business presenters. 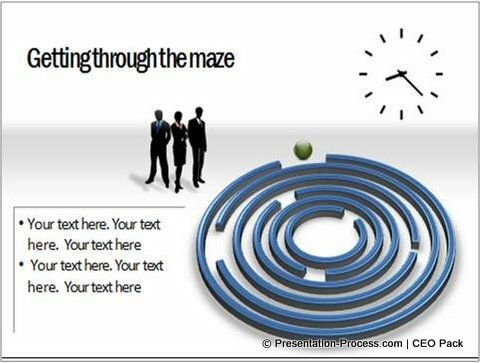 In the above diagram, we used the metaphor of a maze to capture the emotions of the team facing a challenging ordeal. The visual of a clock indicates the pressure of time ticking along. The third way is to use the power of custom animation to convey concepts. Most presenters don’t realize the power of a professional and purposeful custom animation in conveying strategic concepts. Strategy Presentation Example:A country manager wanted to talk to his senior management team about how they were all aligned inward to their own goals. He wanted them to align towards the common organizational goal rather than their department goals. It captures the idea clearly and he was able to present the concept step by step. See how well PowerPoint animations can capture business insights! These high quality diagrams are time intensive to create, but the impact they have on your audience is to be seen to be believed. 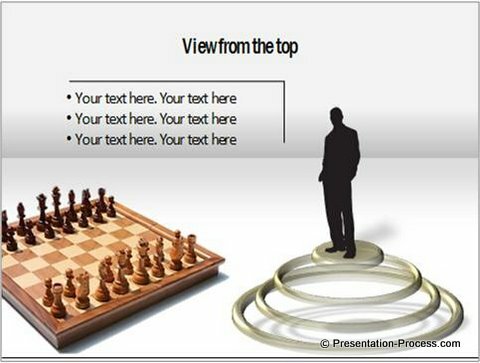 One of our strategic presentations based on metaphors is still remembered years after we have left the organization! A good diagram is worth a thousand text-based slides. Start collecting good strategic diagrams in your library to be used for your future business presentations. You can save time and enhance your message effectiveness. Remember, in strategic presentations, the message needs to travel multiple levels without losing its meaning. A good metaphor or diagram helps you communicate effectively.